Ready for a cool six sigma training game? I present to you the Gummy Bear Design of Experiments otherwise known as Bears in Space. I came across this fun statistical adventure while reading the exciting Minitab blog. Believe me, it is exciting! Where else can you learn how to use a 2-sample Poisson rate test to escape a horde of zombies?!! Cody Steele at the Minitab blog has been using his excellent statistical software to analyse data gathered during this design of experiments using gummy bears hurled by catapults. Who says six sigma is boring! I've worked with catapults before during my six sigma training, but the game I used was a fabricated kit game that you can purchase for hundred of dollars. The beauty of catapults is that there are multiple variables you can adjust to get your final results. Perfect for a DOE. In the Bears in Space six sigma training game, the catapult is made from two popsicle sticks and two elastic bands (or rubber bands, if you prefer). An elastic is wound firmly around the end of one of the sticks. The other popsicle stick is placed on top of the first and the second elastic wraps the two sticks tightly together at the other end. A small dowel or pen is slid in between the two sticks to create a fulcrum. If attached properly, you should have a spring loaded catapult. After gingerly placing a gummy bear on the end of the popsicle stick, you can bend down the stick and let it go, sending the gummy bear soaring through the air. The goal is to measure the distance that your gummy bear travels, the "Y" output, and determine which "X" or inputs contribute the most. In addition to all the variability created by joining two sticks together with an elastic band, the catapult itself is placed on an incline. The position on the incline can be measured and adjusted. 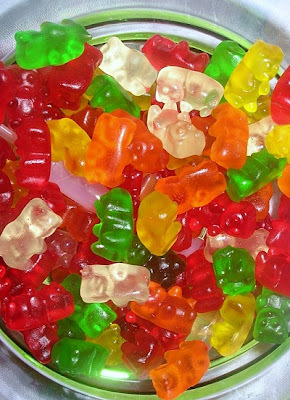 One of the inputs to be evaluated is the colour of the the gummy bears. Do green ones fly further than red ones? At the beginning the red and green bears are to be launched in groups. As the participants improve their skill with the catapult, the colour launched last tends to travel further. Naturally a discussion about the importance of randomization ensues. More details can be found on the Bears in Space .pdf. , including identifying sources of variation, blocking, adjusting the fulcrum and the launch angle and, of course, analyzing all the data. This appears to be a fun lean six sigma training game with plenty of opportunity to generate lots of data. And the gummy bears are a nice touch. Just don't eat them after shooting them all over your dirty shop floor! Do you have any experience learning how to do a DOE with a simulation or game? Please share in the comments below. 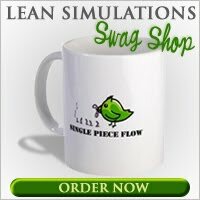 I've added this game to my list of free lean games and simulations. I'm glad my post helped you find the Bears in Space exercise. It's the best day of statistics class every semester I teach! I'm love the idea of your site, and I'm looking forward to trying out some of your ideas. I'm an avid reader of the Minitab blog and I love the irreverent style you and the other contributors bring to a "dry" topic like statistics. Thanks for stopping by!